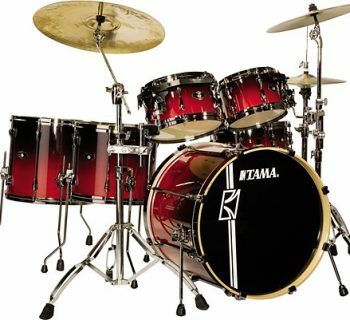 (2nd August 2018, Ridgeland, SC) Currently celebrating its 135th Anniversary, Gretsch Drums has announced the addition of several durable Nitron laminates to its line of popular-priced drumset series including Catalina Club, Renown, and Gretsch Energy. The Gretsch Catalina Club 4-piece Jazz configuration is now available in Blue Satin Flame, Renown Series drumsets are now available in “big flake” Turquoise Sparkle and Copper Sparkle finishes, and the “ready to play” Gretsch Energy series sets now include a Ruby Sparkle finish option. Now available in an eye-catching Blue Satin Flame finish, the Gretsch Catalina Club has received worldwide acclaim as the perfect drum kit for drummers who need a fantastic-sounding, smaller sized, professional grade kit. 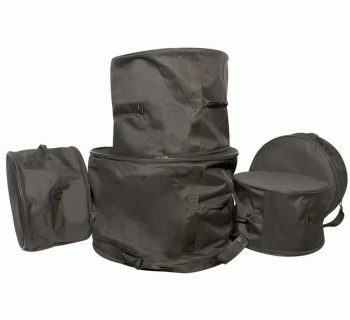 Catalina Club 4-piece configurations are built around a 14” deep bass drum that delivers a warm, punchy vintage tone. 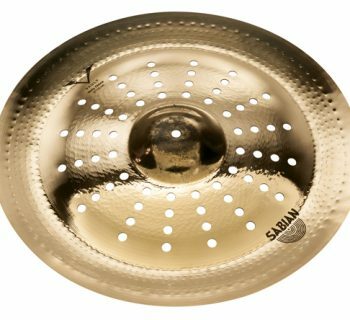 It’s hardware components give the series a distinctive flair that pays homage to the company's 135-year legacy. 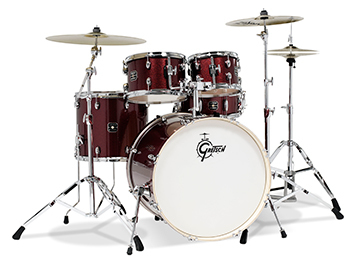 From the round “gas cap” bass drum mount plate and Mini GTS mounting system to the reduced-mass tom mount brackets and Gretsch T-Wing screws and bolts, Catalina Club has an incredible, drummer-friendly feel with classic mahogany shells and the original 30-degree bearing edge that made them famous. Additional Gretsch Catalina Club finishes include Gloss Crimson Burst, Piano Black, Satin Antique Fade, and Satin Walnut Glaze. 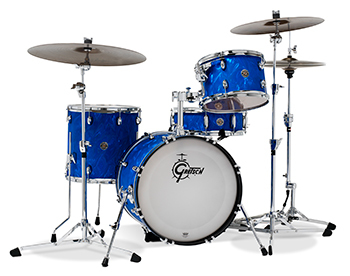 *Blue Satin Flame finish is available only in CT1-J484 configuration, 7 x 10" and 14 x 20" add-ons. 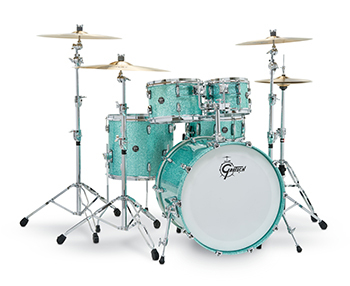 The Gretsch Renown is now available in two all-new luxe looks, “big flake” Turquoise Sparkle and Copper Sparkle finishes. 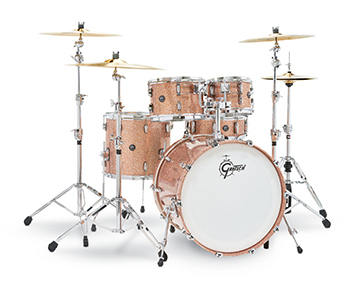 Renown features the classic 7-ply Gretsch formula maple shells, with 30-degree bearing edges and exclusive “Silver Sealer” interiors and Gretsch's player-friendly “302” hoop—the same hoop used on Gretsch's Brooklyn and Broadkaster series drums. Additional Gretsch Renown finishes include: Cherry Burst, Gloss Natural, Piano Black, Satin Tobacco Burst, Silver Oyster Pearl and Vintage Pearl.